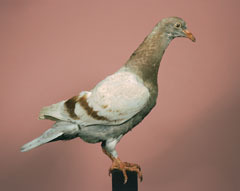 Pigeons are the same animal as doves. "Pigeon" and "dove" are two different names for the same bird. But when we call a bird a "dove" it is venerated, and when we call that same bird a "pigeon" it is reviled. Many people associate city pigeons with pigeon poop. But pigeons don't poop any more than any other animal. Pooping is an essential part of being alive. Animals and people that do their living outdoors are faulted for performing normal and necessary living functions. Pigeons have been associated with all kinds of people, both rich and poor. In the French Revolution, pigeon houses were torn down because they represented privilege. Today in Brooklyn, for example, raising pigeons is a distinctly working-class hobby. But around the world, all kinds of people enjoy feeding the pigeons in parks. Some people think of pigeons as pests, and they try to keep pigeons away from their property. As you walk around the city, you may notice pigeon control devices like spikes, owl figurines, wire nets, chemical "hot foot", and electric shock strips. Similar technologies are used to deter undesirable people. Park benches that are designed to keep you from sleeping on them, annoying music played by storefronts to keep you from hanging out outside, sprinklers that douse you when you try to sleep in the park, surveillance cameras to make you nervous, and of course police are all ways of treating some people as pests.